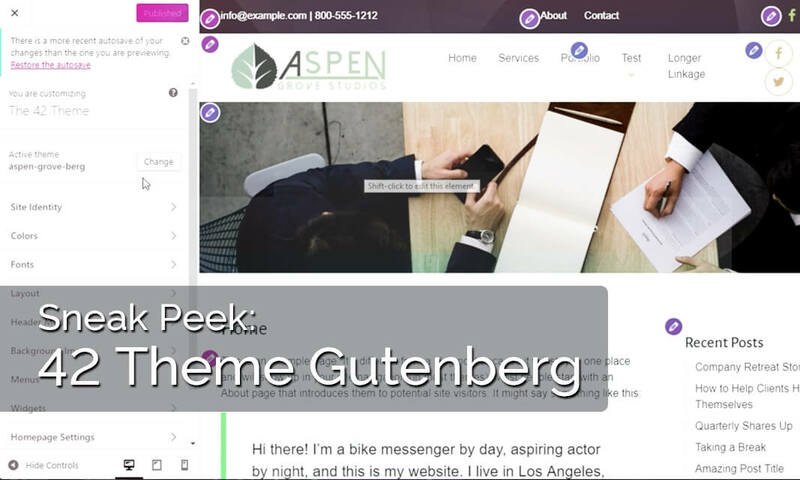 Introducing The 42 Theme for Gutenberg from Aspen Grove Studios! Introducing The 42 Theme for Gutenberg from Aspen Grove Studios! Introducing The 42 Theme for Gutenberg from Aspen Grove Studios! We’ve been working a long time to bring you this exciting new project based on WordPress’ new visual editor, Gutenberg, and now we’re ready to introduce it to you! The 42 Theme will be released on the Aspen Grove Studios site soon, as well as in the WordPress Repository, but take a sneak peek at what’s to come. What can you expect with the new release of The 42 Theme? Watch as Aspen Grove Studios’ lead frontend developer, Jonathan Hall takes you through a preview of the exciting features and options included in the beta version of The 42 Theme in this video! The Gutenberg Printing Press was a workflow breakthrough because it allowed you to print 42 lines at the same time. 42 is the ASCII code for the * which represents a wildcard or anything in code, this theme can be used for anything. The * is also the logo of Elegant Themes (paying homage to our roots, thank you Nick Roach). The ABC computer was at the center of a landmark patent case which resulted in the ‘computer’ itself being unpatentable and ‘open to all’; a mantra that runs deep in WordPress. It was completed in 1942. In The Hitchhiker’s Guide to the Galaxy (one of our favorite science fiction books), 42 is the meaning of the life, the universe and everything. We hope you enjoyed this preview of The 42 Theme, and anticipate its arrival on Aspen Grove Studios and in the WordPress Repository as much as we do! Remember to sign up for our email list to stay up to date with the latest news and notifications of release dates! We love hearing from you, so post your comments below! Will this theme require Divi as a parent? Will we need the classic editor plugin?